When we imagine things, we imagine them from our own perspective. Let’s stop right there and just imagine if we could see things from another person’s point of view. 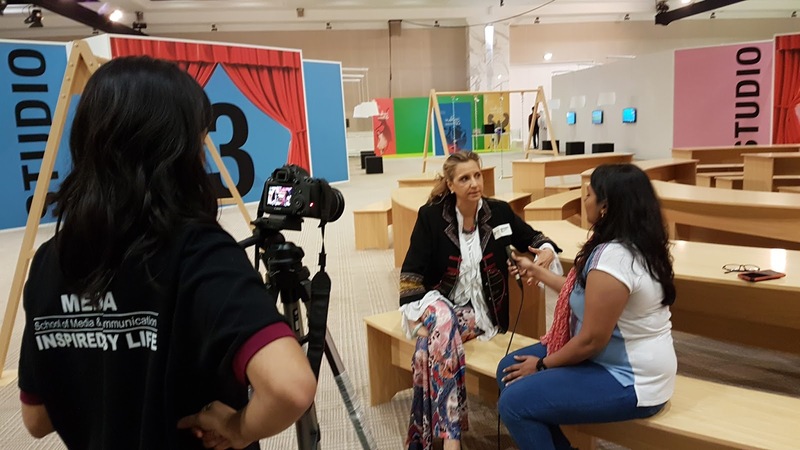 That is exactly what I did today at the Children’s International Film Festival held in Sharjah. I entered the festival with a different aim in mind but as soon as I reached the scene of the action I found myself lost in the calm environment and within that surrounding my eyes fell upon a group of people running around with equipment’s I practically have zero knowledge about. That was the point where I decided to let things move out of my own hands and fall into the hands of very reliable, technically well-equipped final year media and communication students. The first thing I noticed when I entered this place was how colourful it was, it complimented the words 'Dream Big' etched on the walls perfectly because the colours added a very dreamy feel to the environment. 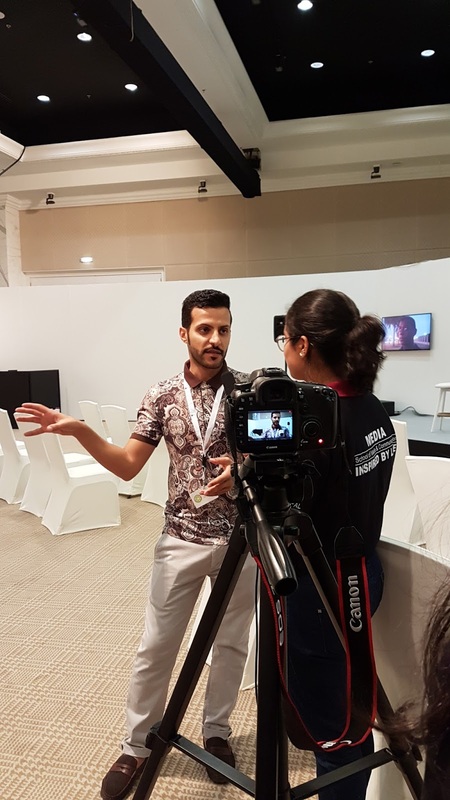 As a reporter for the event, my first job was to find potential people I could interview, so that I could gather as much information as possible about the event. I got a chance to interview some very well informed and sagacious people. In the morning, we interacted with children who were attending the event. It was a pretty stressful situation as handling children is always a challenge, but we were successful in managing it. In the evening, I attended one of the workshops held by Sebastian Reichold, a Visual Effects Director at Pixmondo (Germany), and had a chance to interact with him as well.He stressed on the fact that the visual effects must have a real feel. It definitely was one of the most interesting workshops I've attended, because it made me realize how animation is such a difficult task at hand. His explanations about the dragons, created in the T.V series ‘Game of Thrones’, opened my eyes to the complexity and planning involved in the whole process of animation. At another workshop about making short movies using smart devices, I caught up with the presenter Tamer Eldemerdash, a sound engineer at Sharjah Media Corporation.He spoke about making films using devices such as phones, and how anyone can learn to make movies professionally when they start at the basic level of making short videos using phones. In the end we must always be geared up for very unpredictable situations, though we had a script planned for shot divisions and divided duties, the whole game lies in mixing and matching and relying on your fast instincts to be able to make decisions on the spot. Overall it was a hectic day, with a lot of quick thinking involved, but I somehow managed to get through the day. As a camera person, I always keep my eyes open to places where the camera would be able to pick up beautiful spots, that define a place in the best way possible. When I first stepped into the main hub at the Sharjah Children’s International Film Festival, my eyes fell on some of the most colourful spots where video footage would look mesmerising. 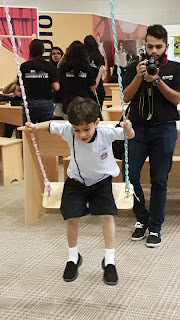 I also spent a fair amount of time trying to capture shots of little children on the swings and in different places, along with my friend Karan, who was shooting for the promotional video at the event. It was a very difficult task to be able to capture natural shots of children as they tend to get very conscious the minute they realize they are being photographed. Another one of our major challenges was the lack of lighting around the area, but we handled the situation using a portable light and chose then to shoot in a well-lit background. My job was to follow the reporter and make her interviews look as appealing to the human eye as the information being collected. I had the opportunity to capture footage of the first workshop,held for the special needs children from Sharjah Charity for Humanitarian Services, where they were taught how to be confident in front of the camera. The children sang songs along with the Disabilities Educator from Sharjah Art Foundation, Sahar, who was the presenter at the workshop. On asking her about the most rewarding part of her job, she said “Being with the kids and seeing them smile”. 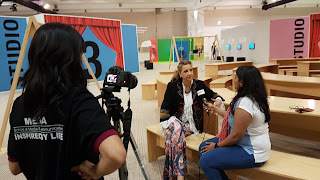 I also managed to capture an interview with Firdoz Bulbulia,who was one of the jury members at the festival. 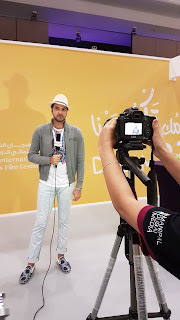 I recorded an interview with a film maker Ali Ali, who made a short documentary named ‘Charlie’, which was about a dyslexic child and the difficulties faced by him and his family. In the end, the most difficult part of my job is to have a good presence of mind, from remembering to hold the record button to walking around trying to figure out the best places to shoot. The experience is definitely unforgettable because we learn to handle problems without having to crib about it to anyone. Being in an environment where everyone around you is in the same mental wavelength as you are , motivates you to create more. The hardest part of my job is to be able to deliver my work on time because the deadlines are tight and to work within particular deadlines is important. That puts you under a lot of pressure. Through the hustle bustle, the team members also took out time to enjoy their time at the festival,where they clicked photographs at a 3D Photography booth, and took pictures at various locations.